Ion exchange whey (milk) protein isolate, microfiltered whey (milk) protein isolate, vitamin/mineral/amino acid blend (taurine, potassium [as potassium chloride], chloride [as potassium and sodium chloride], calcium [as dicalcium phosphate dihydrate], phosphorous [as dicalcium phosphate dihydrate], glutamine, magnesium [as magneisum oxide], vitamin C [ascorbic acid], vitamin E [as dl-alpha tocopheryl acetate], niacin, zinc [as zinc sulfate dihydrate], vitamin A [as palmitate], pantothenic acid [as d-calcium pantothenate], vitamin B6 [as pyridoxine hydrochloride], copper [as amino acid chelate], manganese [as manganese sulfate dihydrate], riboflavin, thiamin [as thiamin hydrochloride], folic acid, biotin, iodide [as potassium iodide], chromium [as amino acid chelate], vitamin K, molybdenum [as amino acid chelate], selenium [as amino acid chelate], vitamin B12), soy lecithin, cocoa, xanthan gum, natural and artificial flavor, sucralose. For a rich, thick shake, mix 2 scoopfuls (65 g) with 12 fluid ounces of water in a shaker or blender. If a shaker or a blender is not convenient, IsoPure can be stirred into solution with a spoon. Drink one serving daily. Use this product as a food supplement only. Do not sue for weight reduction. Whey Protein Isolate, Cocoa (Processed with Alkali), Vitamin and Mineral Blend (Dicalcium Phosphate, Potassium Citrate, Ascorbic Acid, Sodium Chloride, Zinc Sulfate, D-Alpha Tocopheryl Acetate, Niacinamide, Calcium D-Pantothenate, Copper Sulfate, Manganese Sulfate, Pyridoxine Hydrochloride, Riboflavin, Thiamine Hydrochloride, Vitamin A Acetate, Chromium Chloride, Folic Acid, D-Biotin, Potassium Iodide, Sodium Molybdate, Sodium Selenite, Phytonadione, Cyanocobalamin), Soy Lecithin, L-Glutamine, Xanthan Gum, Natural and Artificial Flavor, Sucralose. For a rich, thick shake, mix 2 scoopfuls (63g) with 12 fluid ounces of water in a shaker or blender. If a shaker or a blender is not convenient, ISOPURE can be stirred into solution with a spoon. Drink one serving only. Ion exchange whey (milk) protein isolate, microfiltered whey (milk) protein isolate, Vitamin/Mineral/Amino Acid Blend (taurine, potassium [as potassium chloride], chloride [as potassium and sodium chloride], calcium [as dicalcium phosphate dihydrate], phosphorous [as dicalcium phosphate dihydrate], L-glutamine, magnesium [as magneisum oxide], vitamin C [ascorbic acid], vitamin E [as dl-alpha tocopheryl acetate], niacin, zinc [as zinc sulfate dihydrate], vitamin A [as palmitate], pantothenic acid [as d-calcium pantothenate], vitamin B6 [as pyridoxine hydrochloride], copper [as amino acid chelate], manganese [as manganese sulfate dihydrate], riboflavin, thiamin [as thiamin hydrochloride], folic acid, biotin, iodide [as potassium iodide], chromium [as amino acid chelate], vitamin K, molybdenum [as amino acid chelate], selenium [as amino acid chelate], vitamin B12), natural and artificial flavor, soy lecithin, sucralose. For a rich, thick shake, mix 2 scoopfuls (63g) with 12 fluid ounces of water in a shaker or blender. If a shaker or a blender is not convenient, IsoPure can be stirred into solution with a spoon. Drink one serving daily. Vitamin A, Vitamin C, Calcium, Dl-Alpha Tocopheryl Acetate, Vitamin K, Thiamin, Riboflavin, Niacin, Pyridoxine Hydrochloride, Vitamin B12, Biotin, Pantothenic Acid, Phosphorus, Magnesium, Zinc, Selenium, Copper, Manganese, Chromium, Molybdenum, Potassium And Sodium Chloride, Ion Exchange Whey (Milk) Protein Isolate, Maltodextrin, Vitamin/Mineral/Amino Acid Blend (Taurine, Potassium, Potassium And Sodium Chloride, Calcium, Phosphorus, L-Glutamine, Magnesium, Vitamin C, Dl-Alpha Tocopheryl Acetate, Niacin, Zinc, Vitamin A, Pantothenic Acid, Pyridoxine Hydrochloride, Copper, Manganese, Riboflavin, Thiamin, Folic Acid, Biotin, Iodide, Chromium, Vitamin K, Molybdenum, Selenium, Vitamin B12, Soy Lecithin, Natural And Artificial Flavor, Sucralose, Acesulfame-KIon Exchange Whey (Milk) Protein Isolate, Maltodextrin, Vitamin/Mineral/Amino Acid Blend (Taurine, Potassium (as Potassium Chloride), Chloride (as Potassium And Sodium Chloride), Calcium (as Dicalcium Phosphate Dihydrate), Phosphorus (as Dicalcium Phosphate Dihydrate), L-Glutamine, Magnesium (as Magnesium Oxide), Vitamin C (as Ascorbic Acid), Vitamin E (as DL-Alpha Tocopheryl Acetate), Niacin, Zinc (as Zinc Sulfate Dihydrate), , Vitamin A (as Palmitate), Pantothenic Acid (as D-Calcium Pantothenate), Vitamin B6 (as Pyridoxine Hydrochloride), Copper (as Amino Acid Chelate), Manganese (as Manganese Sulfate Dihydrate), Riboflavin, Thiamin (as Thiamin Hydrochloride), Folic Acid, Biotin, Iodide (as Potassium Iodide), Chromium (as Amino Acid Chelate), Vitamin K, Molybdenum (as Amino Acid Chelate), Selenium (as Amino Acid Chelate), and Vitamin B12), Soy Lecithin, Artificial Flavor, Strawberry Powder, Sucralose, Acesulfame-K, and FD&C Red #3. For a delicious shake, place contents of one packet into 12 ounces of water and mix in a shaker or blender. 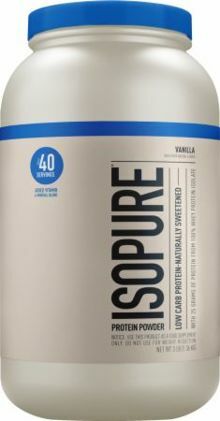 If a shaker or blender is not convenient, isopure low carb can be stirred with a spoon! Ion Exchange Whey (Milk) Protein Isolate, Maltodextrin, Vitamin/Mineral/Amino Acid Blend (Taurine, Potassium (as Potassium Chloride), Chloride (as Potassium And Sodium Chloride), Calcium (as Dicalcium Phosphate Dihydrate), Phosphorus (as Dicalcium Phosphate Dihydrate), L-Glutamine, Magnesium (as Magnesium Oxide), Vitamin C (as Ascorbic Acid), Vitamin E (as DL-Alpha Tocopheryl Acetate), Niacin, Zinc (as Zinc Sulfate Dihydrate), , Vitamin A (as Palmitate), Pantothenic Acid (as D-Calcium Pantothenate), Vitamin B6 (as Pyridoxine Hydrochloride), Copper (as Amino Acid Chelate), Manganese (as Manganese Sulfate Dihydrate), Riboflavin, Thiamin (as Thiamin Hydrochloride), Folic Acid, Biotin, Iodide (as Potassium Iodide), Chromium (as Amino Acid Chelate), Vitamin K, Molybdenum (as Amino Acid Chelate), Selenium (as Amino Acid Chelate), and Vitamin B12), Soy Lecithin, Natural And Artificial Flavor, Cocoa, Sucralose, and Acesulfame-K.
Ion Exchange Whey (Milk) Protein Isolate, Microfiltered Whey (Milk) Protein Isolate, Maltodextrin, Vitamin/Mineral/Amino Acid Blend (Taurine, Potassium [as Potassium Chloride], Chloride [as Potassium and Sodium Chloride], Calcium [as Dicalcium Phosphate Dihydrate], Phosphorus [as Dicalcium Phosphate Dihydrate], L-Glutamine, Magnesium [as Magnesium Oxide], Vitamin C [as Ascorbic Acid], Vitamin E [as DL-Alpha Tocopheryl Acetate], Niacin, Zinc [as Zinc Sulfate Dihydrate], Vitamin A [as Palmitate], Pantothenic Acid [as D-Calcium Pantothenate], Vitamin B6 [as Pyridoxine Hydrochloride], Copper [as Amino Acid Chelate], Manganese [as Manganese Sulfate Dihydrate], Riboflavin, Thiamin [as Thiamin Hydrochloride], Folic Acid, Biotin, Iodide [as Potassium Iodide], Chromium [as Amino Acid Chelate], Vitamin K, Molybdenum [as Amino Acid Chelate], Selenium [as Amino Acid Chelate], Vitamin B12), Soy Lecithin, Artificial Flavor, Strawberry Powder, Sucralose, Acesulfame K, FD&C Red 3. The meal replacement shake for when you’re on the move. It’s full of 42 grams of 100% pure whey protein isolate, good glutamine, vitamins, and minerals. All without lactose, preservatives, sugar or impurities. Now get a move on!